Significance of Insignificance: It Is A Wonderful Life! 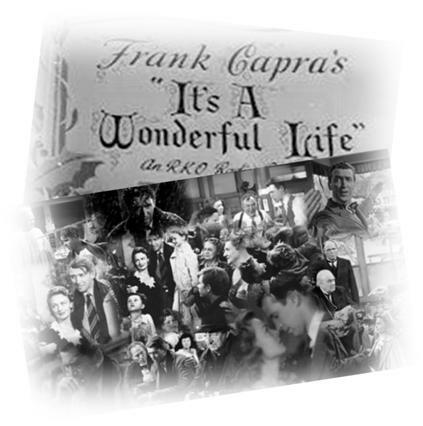 As long as I can remember the Frank Capra’s 1946 movie “It’s A Wonderful Life” with James Stewart playing George Bailey is aired every year. With the advent of Cable TV and increased programming offerings, for the past several years I have not see it. This year, I find myself wanting to see this movie. read more . . . In an award winning essay a young boy expressed his desire to have a Christmas tree. His mother would not allow him to have one because of the connotations of idol worship. This young boy made his case by outlining how his mother had taught him about Jesus and he understood the true meaning of Christmas. His prayer was that his mother would let him have a Christmas tree. I was touched by the young boy’s earnest and sincere plea. You see, all too often we grasp a hold of something and stand on it as gospel. How many of us worship Christmas Trees? Not many, if any. Perceived idol worship can be visualized in many forms. You see many of us take pride in wearing designer clothes and other paraphernalia. Is that worshipping them? This young man made a valuable point that if he completely understands the meaning of Christmas as being the birth of Jesus Christ why would he be denied having a tree. I ran across an article in the World NetDaily by Gary DeMar that identified some key elements to reinforce this young boy’s debate. Apparently the mother had done a good job in teaching her son the meaning of Christmas. Yet, she did not have faith in her son and trust in what she had poured inside of him. During this Christmas season, we have to use it as an opportunity to share its true meaning. This is the time we celebrate God’s ultimate gift to mankind, the birth of His only begotten Son so the breach for our eternal existence would be repaired so we could have the right to everlasting life. God who loved us so much gave the ultimate gift for us to be free of the limitations of this world. We don’t celebrate the Christmas tree, but we do celebrate the One who created the trees, who gave man wisdom to design a Christmas tree so we can use it to share the blessing inherent in the birth of Jesus Christ our Lord and Savior and the gift of eternal life. Accept this gift of empowerment. Contact me for a complimentary coaching session @ The ME Place Mentor Empowerment Institute. When I initially embarked on the Oh Break Out journey more than six years ago, I identified the person I wanted to be the coordinator for the event. At the first meeting I communicated this to everyone. Howbeit, the person I selected wasn’t even there. Yet, I felt she was the right person. read more . . .
Unbridled Freedom! Are You Willing to Participate? It is a humbling experience as you approach an event such as Oh Break Out! You’ve sweat and you’ve toiled to the point that your emotions bounce all over the place. Suddenly it dawns on you; I was never in control in the first place. God is the one who is and has always been in control. It is as though He allows us to move through and at the right moment He lets us know that He truly has everything in His hands. read more . . .